More pumpkin? But it's winter! Yup, like always, I have a bit of pumpkin overhang from the fall season. To work my way through all that stuff, while still posting seasonally appropriate reviews, I'll be posting off-season items once a week as a Throw Back Thursday kind of thing. I thought that would be a fun way to let me work through my stash of food products while staying relevant. 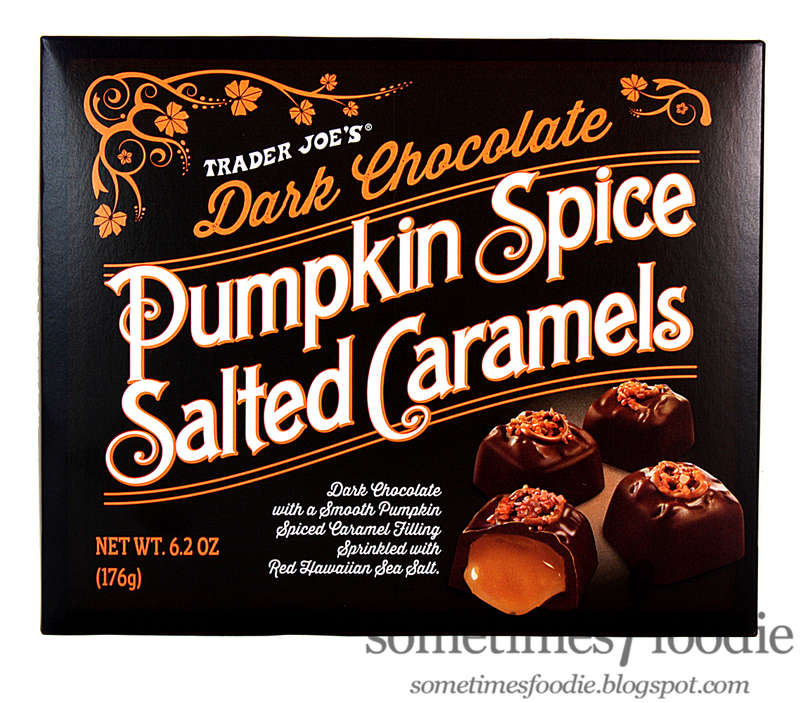 So here's my first throw back to fall, some Pumpkin Spiced Caramels from Trader Joe's. Normally I pick on Trader Joe's packaging for looking unfinished and anachronistic, but they're really stepping up their game. This design is really lovely! The box has a matte finish, which photographs well, and the typeface choices are crisp, clean, and appealing. The colors are limited, and the food imagery is appealing. I love it! It's vintage looking, but not, and it's fancy enough to make a nice hostess gift or addition to your holiday dessert table. Keep up the good work Trader Joe's design team! Inside the box are several chocolates, all beautiful and glossy, with a dollop of caramel on top to keep all the Hawaiian red salt crystals in place. 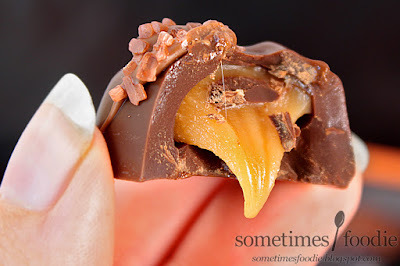 Although they photograph nicely, the dollop of caramel on top makes these candies look a bit messy when you see them in person. At first glance the tops of the chocolates look imperfect, which replicate handmade candies you might buy in a mom and pop shop, but if you look closely...all of the imperfections are the same! 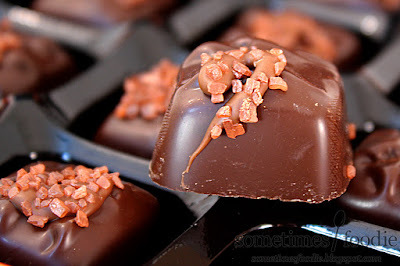 Each candy is so glossy and perfectly forms that they had to be made in a mold, but the faux texturing is convincing enough to make these look gourmet and fancy. I took a bite, and the dark chocolate quality is better than I was expecting, and sweeter, but it compliments the red salt well. I really liked the chocolate mixed with the salt, but the caramel is the selling point of this seasonal candy, and it's the worst part! 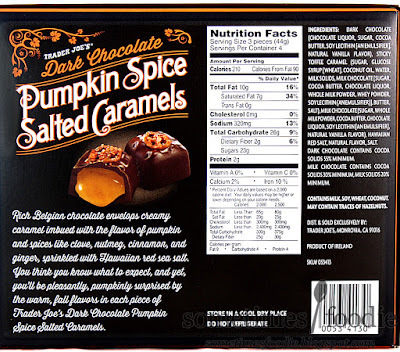 The caramel inside is really heavily spiced, which sounds like a good thing, but it isn't. This caramel tastes so heavily spiced that it feels like I'm eating scented candle wax, not a deliciously spiced caramel. These candies are really nice to look at, but I can't say I'd recommend them. The chocolate isn't bad, and the salt compliments the sweetness nicely, but as a whole, these just don't work form me. I find myself nibbling away on the outsides and leaving the caramel filled center (my least favorite part) for last. Which is a messy eating process, but it's the most enjoyable way for me to eat these. On a Pumpkin Scale of 1-5 (5 being the most pumpkin-y) I’d give this a 2! 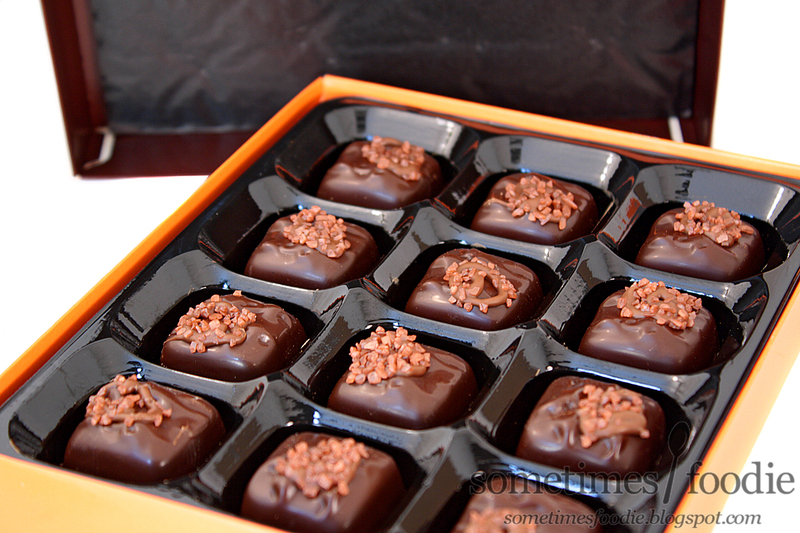 It's like sucking candle wax out of a salted chocolate. Not my favorite, but I could see other consumers really enjoying these.